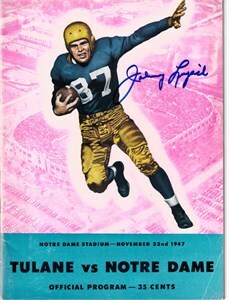 Original complete October 12, 1946 Notre Dame vs. Purdue college football game program autographed on the cover in blue marker by quarterback and 1947 Heisman Trophy winner Johnny Lujack. 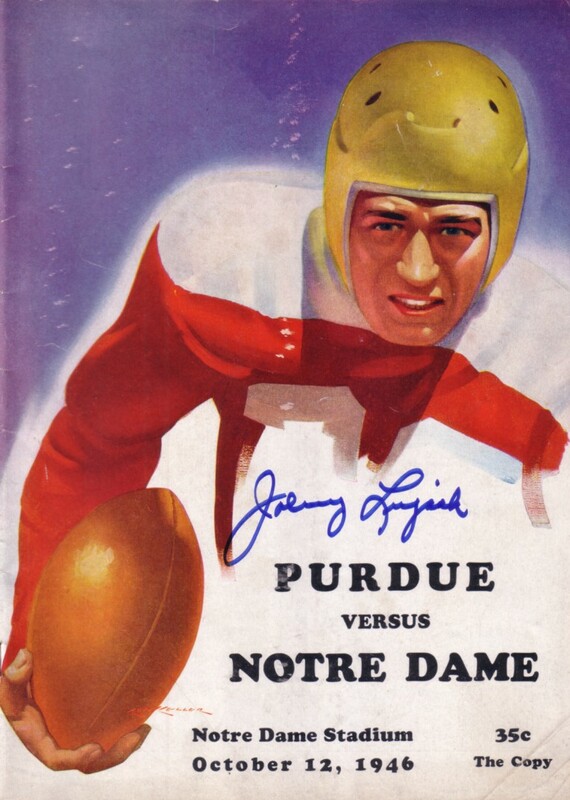 The 1946 Fighting Irish crushed Purdue 49-6, later survived the famous 0-0 tie with Army at Yankee Stadium and were declared National Champions by the Associated Press with a 8-0-1 record. Obtained in person at the Frank Sinatra Celebrity Golf Tournament many years ago. Program has moderate cover creases and other flaws and wear but in fair condition for its age. With certificate of authenticity from AutographsForSale.com. ONLY ONE LEFT.